string(150) "Tripod: 5 3/4" x 1" (legs extend extra 2 3/8" length); Phone holder: 2 7/8" x 1 3/8" x 1"; Shutter: 1 1/4" dia. x 7/32"; PU case: 6" x 3 3/4" x 1 3/4""
string(56) "Case: 2" x 2"; Shutter: 3/8" x 3/4"; Phone Clip: 1" x 1""
Tripod: 5 3/4" x 1" (legs extend extra 2 3/8" length); Phone holder: 2 7/8" x 1 3/8" x 1"; Shutter: 1 1/4" dia. 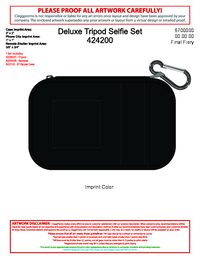 x 7/32"; PU case: 6" x 3 3/4" x 1 3/4"
Case: 2" x 2"; Shutter: 3/8" x 3/4"; Phone Clip: 1" x 1"